ist Professorin für Buddhismusstudien am Exzellenzcluster "Asien und Europa im Globalen Kontext - wechselnde Asymmetrien in kulturellen Austauschprozessen" der Universität Heidelberg. 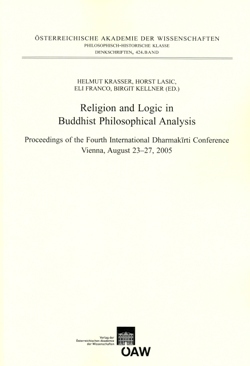 The proceedings volume of the Fourth International Dharmakīrti Conference, held in Vienna in 2005, includes a collection of thirty-six essays devoted to the work of one of the most influential philosophers of India, the six-century Buddhist scholar Dharmakīrti. It is the next volume in a series of Dharmakirti conference proceedings that includes, to date, Studies in the Buddhist Epistemological Tradition (Vienna 1991) and Dharmakīrti's Thought and Its Impact on Indian and Tibetan Philosophy (Vienna 1999). The papers in this volume present research on the Buddhist logical and epistemological tradition in India and Tibet, including its cultural, philosophical and religious significance, and also emphasize the tradition's import on non-Buddhist philosophy and religion. They also report on some of the remarkable (and very important) new textual sources that have become available in recent years, namely, newly discovered Sanskrit texts by Dharmakīrti and his followers. The contributions provide a rigorous and detailed overview of tlle astonishing Progress that has been made in understanding the work of Dharmakīrti and his successors. Moreover, a number of essays break new ground by demonstrating various non- Buddhist contexts in which Dharmakīrti's work was taken up and dealt with critically.